One of my most favorite things in the whole world are “thrifty finds,” so when Rhoda at Southern Hospitality announced a Yard Sale party, I was all over it (a day late…oops). She said to pick your favorite thrifty find. Considering that thrifty finds pretty much define who I am, I realized that would be completely impossible. Almost every single thing that I own is a thrifty find – household, clothing, toys, furniture, dishes…the list goes on and if I didn’t tell you that, you would never know. 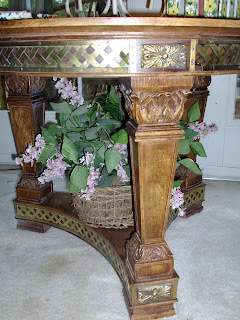 Since Rhoda is a “furniture buff, ” I will stick to a few pieces of fun furniture. 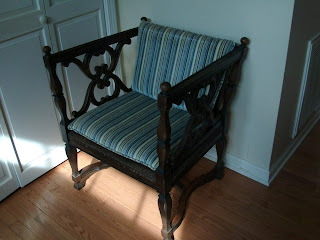 Below is a great yard sale chair that I have hopes of changing up a bit. The fabric is in fabulous shape, so it’s been pushed to low priority. The lines and detail are beautiful – the cushion sits on a woven base. That alone is gorgeous…oops…a little dust came through with the flash. Right next to it sits another unbelievable find. An antique sewing table for only $10. It folds out and could be used as a buffet. 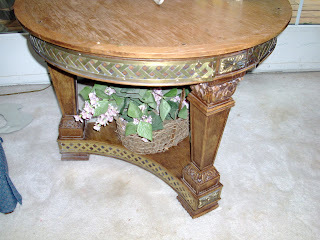 This isn’t how I have it decorated but am showing you a couple items I picked up last week and have busy painting. I never knew that nasty brass candles could look so great with a bit of spray paint. I have gone round and round with decorating the top of this. I am trying out this metal thing. I typically have flowers with candles sticks, but have also had a framed wedding picture with some knick knacks surrounding it. Challenging considering it sits a bit low. Again, the details are beautiful. Can you believe $10? The table sits 14 comfortably with the leaves in and has been the heart of many wonderful life long discussions and soul searching. After I saw how great my sis’s cabinet turned out in the previous post, I am really wanting to tackle this. The challenge is that it has a lots of detail and carvings down below, and makes me a bit nervous being such a novice. The handles are off, and ready to be picked out, but now I want to wait until I decide what color to go with. And since my ceilings are almost 10 feet, it gives me plenty of room to put other yard sale great finds on top of it. Yes, it’s so obvious that this part of my kitchen needs to be painted anything but white. And since my china hutch is overflowing with sweet teacups, I picked this cute thing up for $5. 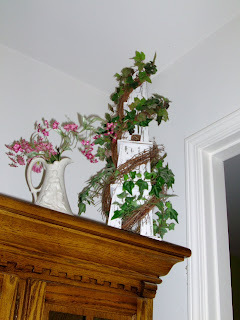 It’s a spot in our great room that isn’t the focal point, but it makes such a cute little accent area. I have two little plates that are going to be hung on each side of the mirror. I just changed the wall up a bit. Everything that you see….total $20 (yep, including the Chabby Chic mirror). I love to have pretty dishes…. I love offering my guests and kids the choice of special teacups any time that they have beverages. The hard thing is that these aren’t even my very favorite finds….everything that you see is within a 10 foot radius. I realized as I started taking pictures that I could go on and on. I guess I just need to get cleaning, dusting and painting and do a room by room tour. This one is another of those WOW finds….I just need advise on what to do for the top. I got this for a mere $20…. it retails for hundreds and hundreds from a top furniture manufacturer. The top needs help. 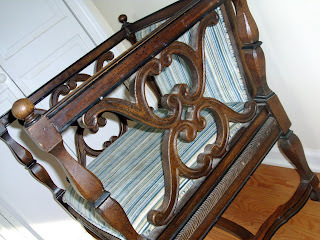 I thought of fabric with a glass piece, painting it, refinishing it…ideas? Look at the intricate detail with the carving. It’s beautiful, even though the flash makes it look cheesy. I have so many more things to show, but I realize this is getting really long. I have quite the bedlam moment to share, but just want to know if I have some unconditional readers who will love me anyhow…it involves the crazy dog again…let me know if you’re ready for a “EEEWWW” moment. It’s so funny and yet surreal, that at moments like this I ponder aloud, is this really my life? I love your chair. I can see it painted black and covered in something pretty. You have some wonderful finds and I do love the white cabinet against the green wall. 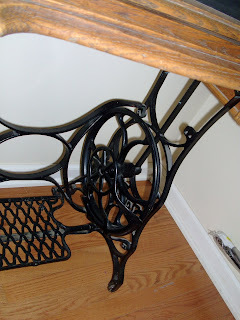 Love the sewing machine… I have one very similar and I think it adds so much character to my home. I love the spot in your great room where you keep your tea cups! Love, love, love the white against the green. So calming and just beautiful. I say paint the table black or white and it would bring out all the fabulous detail. It's a cool little piece! 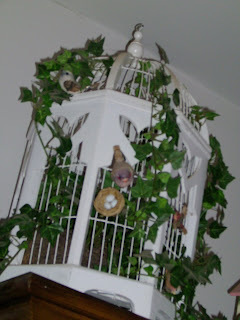 Thanks for stopping by Christina's & my blog! Your finds are so fun. I love to look at all the pretties you get. Thanks for sharing in my finds. Love your finds! Good luck painting your hutch! It will look great! i can’t wait to hear the ewwww moment… bring it on! Great chair!! I would not paint it for anything. 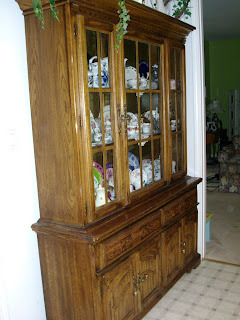 You found some really great deals and I love the story of the hutch. I’ll bet it would be beautiful black 🙂 The table just needs a little polishing love I think and it’s beautiful too. $15 FOR THAT CHAIR? NO WAY! Seriously, great find. Love it. Hi there! I just wanted to say thanks for your sweet comment on my blog the other day. Hi, Jen, thanks for joining the party! You really have found some neat stuff..love that chair, so pretty. And your china cabinet & table sound gorgeous. I'll have to go back & see what you are considering, probably painting it black, maybe? That's a really good look for oak that is not desirable anymore. come back & visit me more often! I'm always up to something fun. I love that chair…and I think it looks fabulous, just as it is. Come over and see my favorite one! You have found some BEAUTIFUL items…it would have been hard for me to pick just one also. Great thrifting!!! I love ALL your thrifty finds! 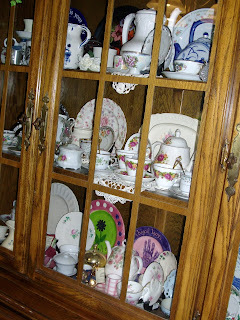 Your china looks beautiful in the cabinet! God bless you! I love your site (got sucked into it for, like the last, 20 minutes!)! I’ll be back to visit soon. I so enjoyed looking at all your beautiful finds. It just made me want to go treasure hunting this morning, so I did. Found some more good bargains and had fun, before I had a meeting that I had to attend for school. ARe you a teacher? I will visit again soon. Wow…you’ve got lots of great finds! I love hearing about being thrifty, it is something I am working on. I really want to hear what you have to say about a wardrobe. Wow, I am jealous! Those are great finds. The chair. I love the chair. I need the chair. Yes I followed you home…but not in a creepy way…and I must say I’m so glad I did! You not only have a beautiful blog with great pictures…but boy howdy do you have a way with words! I love the way you write…I got a ton of giggles along the way. That picture with the flash light and the dog KILLED me! If you don’t mind I’m putting you on my bloglist…I’ll look forward to stopping in and enjoying your day during mine. Awwww, you made my day! I am sorry that you are having computer woes today…it is soooo frustrating, I know! 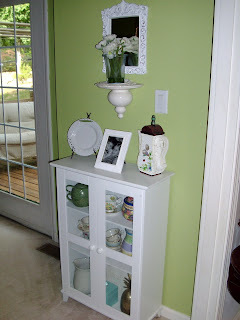 I love your Shabby Chic under $20 vignette, too, so pretty! That chair is beautiful! I can’t believe you got that for $15! You and I could make a killer thrifting team! 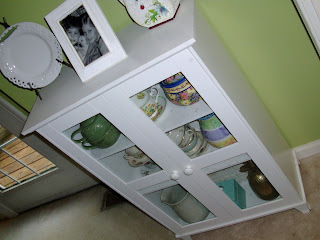 I love the story of your hutch and table. Very sweet. And I can’t wait for the post on the designer wardrobe. For as much as I thrift and bargain hunt, that is one area that I haven’t conquered. But I would love to! Wow – will you fly out to Phoenix to go yard saling with me??? I never find those kinds of treasures. OR I don’t stick with it long enough to find them…I get worn down after 2-3 houses if all I see is garbage. LOVE the chair!!! You go, Girl! Wow! What deals! 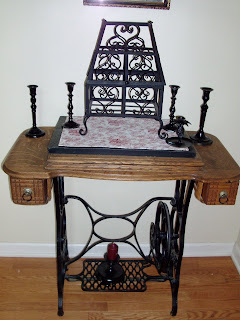 I love your treadle sewing machine table! What great finds! And I think your furniture looks great! You are so lucky to find such wonderful pieces for so little. Have you thought about using tung oil. It usually brings the finish back to life. I put it on some old spinning wheels that had grayed in the weather and the finish is wonderful. What a great looking chair! I love your little white cabinet too – $5.00??? What a find!